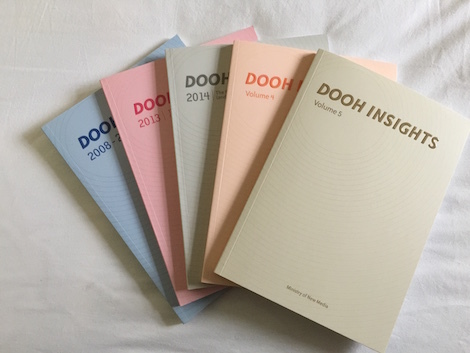 Back in October 2012, to celebrate five years of industry insight from the chief executives of the world’s digital out-of-home networks, we published our first book ‘DOOH INSIGHTS: 2008 To 2012‘ (sub-titled ‘Five Years Of Executive Thought’). With an initial print run of 10,000 copies this book received an amazing reception from an industry starved of informative, high quality, printed material when it was first published. DOOH INSIGHTS: 2008 To 2012 | Five Years Of Executive Thought. Published October 2012 and distributed in London, during New York Digital Signage Week, in Amsterdam and during #dse2013. DOOH INSIGHTS: Volume 6 was published September 2017 in time for the various UK upfronts and New York Digital Signage Week. DOOH INSIGHTS Volume 7 was published in September 2018 in time for the various UK upfronts, Ocean Outdoor’s Digital Creative Competition in London, other award ceremonies and during New York Digital Signage Week. DOOH INSIGHTS Volume 8 will be published in September 2019 in time for the various UK upfronts, Ocean Outdoor’s Digital Creative Competition in London, other award ceremonies and during New York Digital Signage Week. In 2017 we celebrated an amazing 10 years of CEO SPOTLIGHTS. If you are interested in advertising in the next volume of this book then reach out to Russcurry@gmail.com.